After one of the most frustrating campaigns of his career, Peter Pawlett hopes he can hit the ground running this season. 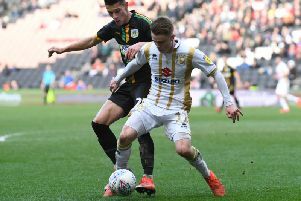 The 27-year-old was limited to just 28 appearances last time out as injuries wreaked havoc with his first season at Stadium MK. Having missed most of pre-season last year too, Pawlett hopes by being fit for the first day this year, he can find some consistency. He said: "I think this is my eighth of ninth pre-season, so I know you have to do your bit and come back in decent shape. We all look fresh and fit, so I hope pre-season goes well and we can start positively. "Driving in this morning, I was telling myself how I need a good pre-season, I can't afford to miss big chunks of the season and get my body robust and ready for the season. Last season was frustrating with injuries, I missed a lot of games, so a strong pre-season will set me up." Despite suffering relegation last season, Dons have been installed as favourites for promotion and indeed the League 2 title before a ball has been kicked. "We need to take it as a confidence boost," Pawlett continued. "We'll need to dig deep and have more of a winning mentality, and that was missing last season. We got stuck in a rut, but we need to start the season positively. "It was the lowest point in my career, getting relegated. For me now, I can learn from it, I know what it feels like and I don't want to experience it again. I want to win promotion this year and make it a positive. We can all learn from our mistakes and low points in our careers." New manager Paul Tisdale has been keen to get to know his players before delving back into the transfer market to seek out replacements. And though Dons have only been back in training fora handful of days, Pawlett knows everyone will be out to impress the new boss. He said: "It's a fresh start for us all, there's a real lift about the boys. It was disappointing last season but we've got ot draw a line under it now, learn from it and move on. Hopefully this season will be a lot more positive. "We've only a couple of days in but the manager has come across really positively. But I like the way he has come across so far. There will be changes, no doubt about it, but it's too early yet to see what might change. "He hasn't seen much of us, clips from the analysts last season but he wants his to form his own opinion on who he wants to be here and it's up to us to impress him."